More excuses and Mac N Cheese. oops....massive fail on the keeping up to date. it feels like every one of my blogs in the last year have been sparatic and appologetic with empty promises to stay up to date. They aren't purposefully empty as much as I am scatterbrained and half the time I forget my blog exists. But this time my reasons are legitimate! Lots of changes have been going on in my little life up here, and they have definitely been a cause for distraction. 1- Finally got into the apartment! We couldn't be more pleased, I finally have my kitchen all to myself and am slowly still putting it together. There are boxes of missing things but im hoping to dig them out eventually. I need my mandolin and my salad spinner, and all my fancy tongs! boo. 2- I'm baking a bun in the oven right now, and I don't mean in the literal food sense. Being pregnant and trying to work, get my place in order and plan for baby has definitely taken up alot of my free time. Only 8 weeks to go before he gets here! Hopefully when baby does arrive, and I know I must be kidding myself, I will have more time to blog. Even though I have no time now, and having an infant will definitely slow down my cooking, time to take pictures of it, and time to put it online, I may still really want to have something to do during nap time. Here is hoping! It will also add baby food to my culinary repertoire so im looking forward to new fun food thoughts brewing up in my brain. FOOD! 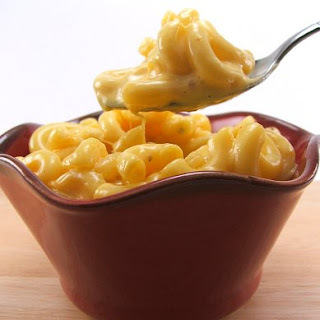 I have tried before to make stovetop macaroni and cheese. I thought it would be easy, and it should be. But the other times I made it, I botched it. I was scared it was sour and I over scorched the milk, and everytime I would add the cheese directly to the beschamel it would separate. pfft. I don't know how and yet I do know how. This time I tried a different technique other than just tossing the cheese right into the beschamel and according to the tastebuds of both myself and my husand, BINGO! For this recipe, the only number you really need to remember is 2. 2.5 cups (or 3) grated cheddar- you choose the grade, I used old. blends are nice too. In a pot, boil well salted water and add macaroni. Cook to al dente and drain. Turn up the heat to just under medium low and whisk constantly until it starts to just bubble and thicken. Add your salt and pepper (and even garlic salt) now. Add the macaroni, and mix together with a spoon, tossing until it is obviously considerably hot (again, dont turn it up we dont want to scorch). Remove from heat and pour in the cheese. stir it vigorously until it is fully melted and you are ready to eat. Doing it this way and adding the cheese at the end is a tip I got from Sandy Richard of Food network Canada and this was the best and creamiest way I have ever gotten it to turn out. Thanks Sandy! *add ham in small bite sized chunks. Serve then or put all in a casserole dish, cover with crushed croutons or a favourite casserole topping of your choice and bake. *Some recipes tell you to add mustard powder to your beschamel....haven't tried it yet. You choose!